Since 2009, the United States has played a driving role in increasing tension between China and South-east Asian countries, turning the South China Sea into a regional hot spot. No one benefits. On several recent occasions, Admiral Harry B. Harris, the Commander of the United States Pacific Command, and Mr Daniel Russell, the US Assistant Secretary of State for East Asian and Pacific Affairs, made remarks or comments on the South China Sea issue, accusing China of threatening neighbouring countries and undermining regional stability. China and some littoral countries of the South China Sea have had disputes over territorial and maritime interests for more than three decades, but China and the relevant claimant countries have managed to address differences and control risks, not letting the issue hinder the sustained growth of bilateral ties among them and China-Asean relations at large. In November 2002, China and Asean countries signed the Declaration on the Conduct of Parties in the South China Sea (DOC), stipulating that China and Asean countries will resolve their territorial and jurisdictional disputes by peaceful means through friendly consultations and negotiations, and conduct relevant maritime cooperation. However, since the US adopted the so-called rebalancing strategy in the Asia-Pacific, the South China Sea issue has become increasingly prominent. Since 2009, some US senior officials have repeatedly made irresponsible remarks about China's policy, rendered support to the countries having disputes with China, and gone even further to drive wedges between China and South-east Asian countries. I would argue that 2009 marked the watershed of the South China Sea issue and the US acted as the main driving force behind the tension in the South China Sea. This conclusion is based on the following foundations. After Mrs Hillary Clinton's first visit as the US secretary of state to Asia in 2009, some South-east Asian countries made considerable changes to their policies on the South China Sea issue. Mrs Clinton left Asia in February. Shortly after, in March, the Philippines passed a new baseline law to claim sovereignty over the Huangyan Island and some of the Nansha Islands. In May, Vietnam completed the submissions of outer limits of the continental shelf beyond 200 nautical miles from the baselines to the Commission on the Limits of the Continental Shelf (CLCS), claiming sovereignty over China's Xisha and Nansha Islands. Thanks to the abetting by US senior officials, the South China Sea issue gradually evolved into a disturbing regional hot spot. In May 2012, at a hearing of the Senate Committee on Foreign Relations, Mrs Clinton said that China's claims in the South China Sea exceeded what was permitted by the United Nations Convention on the Law of the Sea. During her July visit to Vietnam, Mrs Clinton reaffirmed US support to Vietnam. The US also made efforts to encourage the leaders of some South-east Asian countries to discuss the South China Sea issue at Asean meetings, trying to rally the entire Asean against China. As a result, the differences inside Asean accumulated due to the yawning gaps among the positions of its member states on the South China Sea issue. With the firm support from the US, the Philippines made up its mind to go back on its bilateral agreements with China to resolve the South China Sea issue through negotiation, and initiated the arbitration case. With the so-called arbitration award being just around the corner, the US claimed, in a warning tone, that China will pay a great price if it refused to comply with the award. This well indicated that the US supported certain claimant countries not to address the disputes through bilateral consultations with China, rather encouraging them to seek confrontation with China. This is not unexpected if we connect the dots, because the US has been staying behind the arbitration case as the manipulator, and doing whatever it can to ensure that the Philippines wins the case. It is also highly odd, to say the least, to see the US, which is not even a signatory to Unclos, keep asking the countries, China included, that are already acceding to Unclos, to respect international law. For a long time, there has never been an issue concerning freedom of navigation and overflight in the South China Sea. These rights have never been affected. The so-called issue of navigation and overflight freedom was totally created and kept being played up by the US. 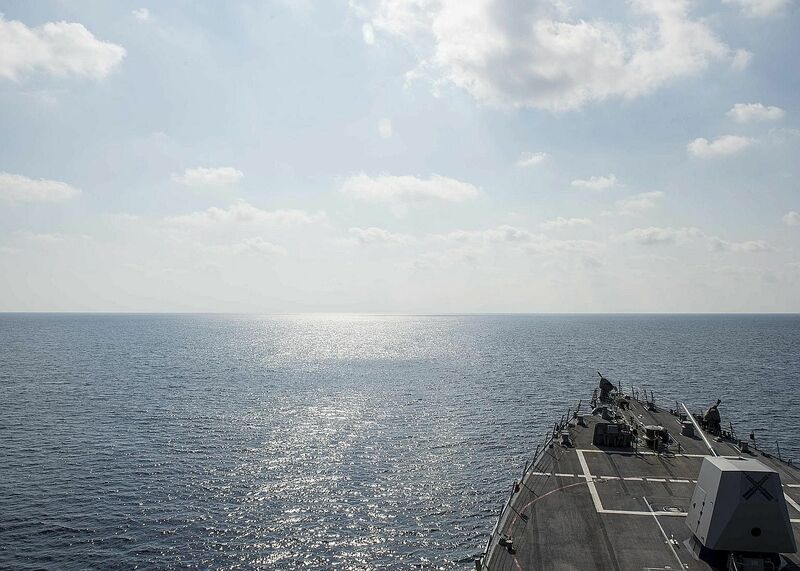 Since 2015, under the name of safeguarding freedom of navigation and overflight, the US has become a front runner, rather than a backstage manipulator, on the South China Sea issue. The US version of navigation and overflight freedom, in essence, means the US Navy warships freely going anywhere all around the world. The risk of militarisation does exist in our region, but it merits careful study on who should be held accountable for that. As early as in 2011, the US claimed to deploy 60 per cent of its military resources in the Asia-Pacific. In recent years, with its rebalancing strategy put into practice, the US tightened its military ties with its regional allies, expanded the arms build-up and flexed its muscle through military exercises, thus generating tensions in the South China Sea. To cite just a few examples out of many: the US beefed up its military aid to the Philippines and Vietnam, and signed the Enhanced Defence Cooperation Agreement with the Philippines, regaining a right lost over two decades ago to station troops and weapons in the Philippine military bases. The US has also repeatedly dispatched its navy vessels approaching the 12-nautical-mile waters of, and military aircraft flying over, relevant islands and reefs of China's Nansha Islands. Furthermore, the US always practises double standards when it comes to the South China Sea issue. While pointing fingers at China and criticising China's construction efforts on its own islands and reefs, the US chose to ignore the facts that the Philippines and Vietnam had illegally occupied, all in all, 42 islands and reefs in the South China Sea, and carried out land reclamation on relevant islands and reefs starting from as early as 1980s. The US' rebalancing strategy has blinded some claimant countries with illusions. They are wishfully thinking that, with US backing increasing, they can deal with the South China Sea issue through confrontation instead of consultation. The US has become used to acting as a policeman or judge on global issues, and indulges itself in making rules and dictating ways to execute them. The US cannot tolerate others challenging its global hegemony and believes that all issues should be dealt with as it pleases. The US does not always practise democracy in international relations, but is dictatorial and overbearing. What the US has been doing has been often criticised, which is quite well known to some American political figures. However, bad habits die hard. It is no coincidence that the changes in US policy have been followed by some South-east Asian countries making changes to their policies on the South China Sea issue. The tension in the South China Sea was intentionally churned and hyped. What the US has been and is now doing will end up in a more split Asean. China is a strong supporter of a rule-based international order. However, the international rule of law is what the entire international community follows, not a tool to be exploited by a handful of countries to pursue their political agenda. All regional countries should work together to safeguard the regional peace and stability and prevent our region from gradually sliding into the "South China Sea Trap". China and Asean should stick to the dual-track approach in addressing the South China Sea issue, which highlights that the disputes should be addressed properly through friendly negotiations and consultations among countries directly concerned, and the peace and stability of the South China Sea should be safeguarded by China and Asean countries. Nowadays, the South China Sea issue has become a hot topic disturbing Asean leaders' meetings and the East Asia Summit, and has been hyped as a security issue affecting peace and stability in East Asia. From this perspective, it seems that the US might have succeeded in fishing in troubled waters. But in the longer run, no one will ever gain from increasing tension in the South China Sea. •The writer is Ambassador of the People's Republic of China to Asean.